Consider the difficulties of traveling on the airlines these days and you’ll want to fly on private jets instead. Then, add a pet to the equation. With the restrictions put in place by the airlines, which vary from carrier to carrier, it can be difficult to take the family pet along on a trip. Once en route, complications such as missed connections, weather or maintenance delays can wreak havoc on the best laid travel plans. Most airlines require that animals larger than 20 pounds be transported in the cargo compartment, an often inhumane and harsh environment in all but the mildest seasons. Many times the strange sounds and unfamiliar surroundings are so overwhelming that many pets can’t handle the stress. According to the Humane Society, as many as 5000 animals each year are lost, injured or accidentally killed during commercial airline travel. Even if a pet is small enough to be allowed in the cabin, they must be constrained in an approved carrier just barely larger than the animal itself, and are subject to restrictions based on limits of the number of animals traveling in the cabin. No longer do pet owners have to worry about their pet’s safety when traveling. Desert Jet, the Palm Springs area’s premier jet charter service, has introduced a new complimentary program on private jets to cater to our four-legged friends. Jet Wags™ allows travelers and their pets to enjoy all aspects of your charter flight with special amenities and conveniences tailored to the needs of pet travelers. When your companion travels with you on a Desert Jet flight, he or she is free to sit next to you or on your lap, off-leash and without the confines of a crate, in the same level of comfort you enjoy. Jet Wags™ amenities include special treats for doggies, a pet water bowl and magazines such as “Fido Friendly,” “Modern Dog,” and “Bark” on the aircraft for your reading pleasure. 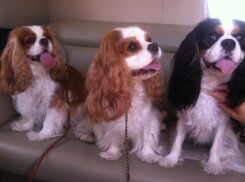 “As pet owners ourselves, we love being able to offer our clients these special amenities”, said Denise Wilson, President of Desert Jet and the guardian of three Cavalier King Charles Spaniels. “We travel extensively with our own pups so we understand the importance of peace of mind and comfort when traveling with pets”. Desert Jet’s love of animals extends beyond the cabin to various charitable endeavors. Desert Jet volunteers their aircraft for transport missions flying puppy mill rescues on behalf of several national rescue organizations to their foster and forever homes.